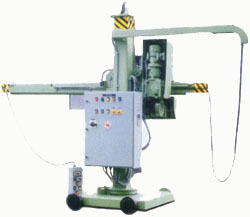 Column and boom manipulators are used for automatic welding in fabrication industries such aspetrochemical, submarine manufacture, nuclear and conventional power generation plant, on shore and offshore. Column and booms consist of a boom which can be elevated up and down the column and also driven forwards and backwards. 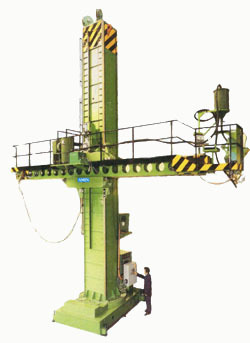 The welding head is carried at the end of the boom together with slides and other accessories. 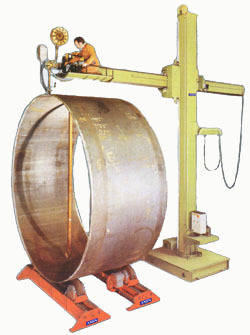 Column and boom manipulators are also used to carry heavy duty grinding heads which can weigh over 800 kgs for the grinding of longitudinal and circumferential seams. 1. a steel fabricated base where the column is stationary. 2. traversing base or bogie to allow it to move along a suitable track way. The columns are nearly all mounted on slewing rings to allow the whole column to be rotated through 360 degrees. Column and boom manipulators come in all sizes from 1 meter x 1 meter to huge machines capable of welding submarine hulls up to 14 meters in diameter. They are used mainly to carry automatic welding heads which could be TIG, Plasma, MIG or submerged arc welding heads to weld either longitudinal seams or circumferential seams with rotators. The very large columns and booms come complete with access ladders and walkways along the boom with an operators platform to carry the operator in the nearest position for visibility and access to the welding process. With smaller machines, the operation of the column and boom is from ground level. TV monitoring systems and automatic tracking devices enable all the functions of the welding to be activated by an operator on the floor. When choosing column and booms, it is essential that you achieve minimal deflection at the end of the boom and of course minimal vibration of the welding head. Therefore the size of the machined guide ways and guide way rollers are important to guarantee these movements. Furthermore the size of the column and booms are also essential to guarantee these stabilities. Naturally, column and boom manipulators are used in conjunction with welding rotators to carry out longitudinal and circumferential welding in the optimum position of down hand welding. We have different models of C&B which can be used for automation of many different things brining down your cost of manufacturing.